If you’re reading this, we know you like us, but do you really like us? On social media, we mean. We love print, and our thriving arts and culture sector has kept this print magazine alive and steadily growing for the past 17 years. But our website and social media have given us a space to share exciting news as soon as it happens, or projects that we feel are important but just don’t have the space to fit into print. The digital world allows us to interact with you, our readers, friends, supporters and artists, on a more instant and personal basis, from anywhere in the world. Creative Feel is a fun place to work, and we’ll sometimes give you a glimpse of that – when you visit our social media pages, you’ll find videos of our graphic designer hard at work or behind-the-scenes fun at events. Sometimes there are events that you can’t attend – but we will be there and you can experience it live with us, just by visiting us on Instagram (search @creative_feel). Speaking of Instagram, we like to keep things visual there. Go on and have a look, it’s colourful and vibrant (just like the creative sector) and filled with videos and pictures of the things we love. Twitter and Facebook (look up @creativefeel for both) are for connecting, chatting and sharing news – but we still keep the Creative Feel aesthetic. 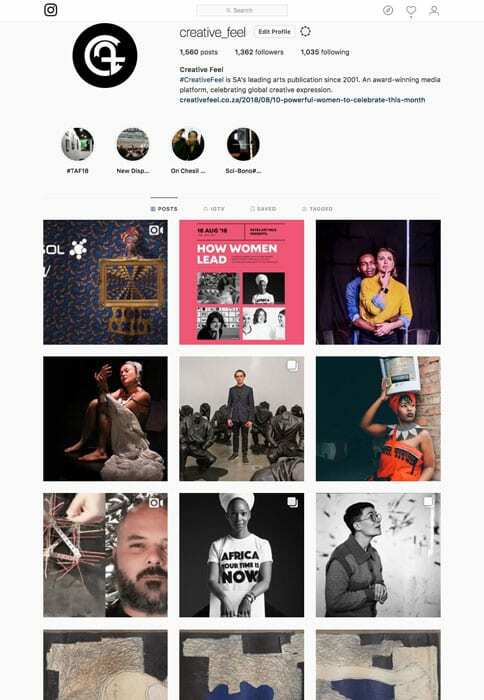 This is where we like to break instant news (we were the fastest-finger-first with the announcement of the FNB Art Prize winner) and share exclusive content. By following us, you’ll also keep up-to-date with what our partners, clients and art friends are up to. Did you see Joburg Ballet’s Bite-sized Ballet and Breaking Ballet series? The videos are incredible, a hit with our followers, and something we just wouldn’t have been able to share pre-social media. As you can see, we are BUSY! We have a dedicated team and we post to our website and social media pages regularly throughout the day. 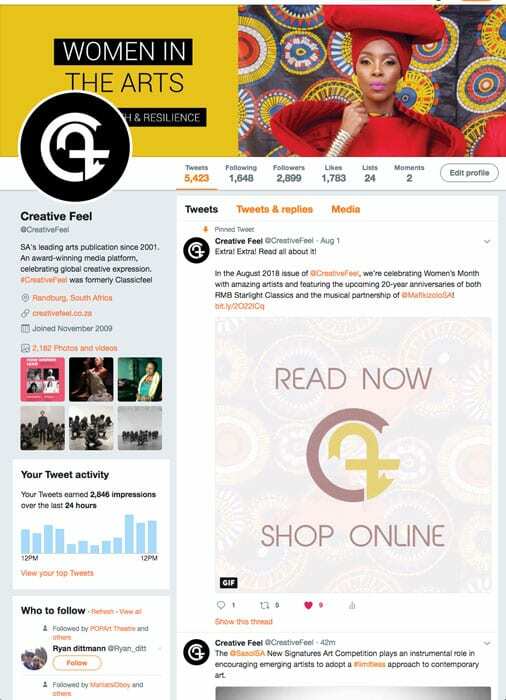 An email newsletter goes out once a week, and it’s definitely worth going to our website (creativefeel.co.za/subscribe/subscribe-to-our-newsletter) to sign-up to receive the latest arts and culture news that you might have missed, directly in your email inbox. So, in short, please go find us online, we would love to engage, to hear your comments and, most importantly, share Africa’s amazing creativity with you!